Fits beautifully. Got this for Ascott next year. Its very flattering and feels comfy to wear. It fits like a glove very nice to wear all dresses I have brought from Roman have been great recommend them. I love this style and have other dresses in the same style. So pretty and nice and swingy for dancing. So comfortable. Love this dress I am 5ft 2in size 12 and it is just a perfect fit. Lovely material. this beautiful poppy dress looks amazing. The fabric doesn't crease & so it also travels well. Fits very well and look lovely on. Pretty dress which flares out and is very flattering. Simple and effective and comfy! Nothing else to say. I already had a dress same style & I love it. so I bought the black monochrome one as well.I went to my local outlet & bought 2 Roman jackets so I can interchange with my 3 dresses. Beautiful dress with bright poppy design. Good fit. Would probably need an underskirt as material quite tin but looks lovely. I ordered online and this arrived last week. Perfect fit and a nice length, so very pleased. The print is beautiful, vibrant and colourful and the fabric has a nice soft texture. Love this dress great fit. Great for holidays as it does not crease at all perfect. Lovely swingy dress! Fits lovely and is a flattering shape!! Very bright and twinned with a short jacket and fascinator it will be ideal for Ascot next year! I already have this dress in four other colour ways/patterns. When Roman brought out this Poppy print version I had to have it! Great fit and perfect for everyday summer use. 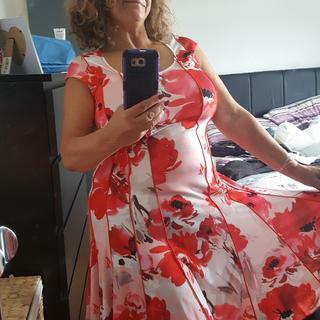 I purchased the poppy print dress for a special occasion I am attending in march I tried it on and was pleased with the overall look of it you cant really tell what the dress will look like until you have all the accessories that compliment it . Like the style, very flattering, and looks as if material will not crease easily, good for holidays. Pleased with my purchase. A good fit and good quality. Fit is ok, nice and cool to wear. But not overly flattering, I prefer a bit of a sleeve. Is this suitable for a 79 year old? BEST ANSWER:Yes this Poppy Print Panel Dress is suitable for any age, shape and size! Can you deliver to Gibraltar? BEST ANSWER:Yes we can ship orders out to Gibraltar.